Replacing idlers is an important part of conveyor maintenance. 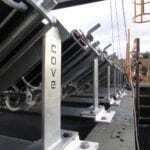 Cove Engineering is making this essential process safer and easier. Replacing conveyor belt idlers is an important maintenance process that can require considerable physical exertion. In order to replace damaged idlers, personnel are usually required to lift conveyor belting and lift the replacement idlers into place, which can often weigh up to 70kg. The combination of manual handling and sometimes tricky access to get into position to change the idlers leads to back aches and other muscular pains. Cove Engineering was cogent of this OH&S issue when designing its idler replacement system Smart Frame, which the company designed for quicker, easier and safer access to conveyor idlers. General manager Michael Lay says the initial design of Smart Frame allows idlers to be changed while the belt was in operation, but the concept evolved over time to instead prioritise the benefits of superior access. This manifests primarily in the Smart Frame’s setup, which lets users change idlers from walkways during maintenance. “The original concept of changing idlers on the fly whilst the belt is running is still valid,” Lay explains to Australian Mining. Which isn’t to say Smart Frame doesn’t provide productivity benefits, either. Lay cites a testimonial from one client who suggests the use of the system means the required downtime to switch out the idlers is 20 per cent of what is normally required. Due to the fact that a single user can operate the Smart Frame, this provides “a compounding effect” saving both time and personnel, according to Lay. So how does it work? The Smart Frame uses a hand-operated locking mechanism that locks the idler into its intended working position. A pivoting shaft system allows for radial movement of idlers in and out of operational position via the use of a spigot and socket tool, allowing for easy replacement from the safety of the walkway. Basket cradles capture the idler as it is lowered out of its normal working position. 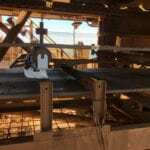 The worker can then remove the old idler either by hand or with a specially designed tool and subsequently replace the old idler with a new one. The cradle is free on both ends of the idler so when the rotating arms of the Smart Frame are rotated upwards, they automatically engage with the slots in the idler shafts and pick the idler up. The idler then locates into the frame and is locked into the operating position.. The Smart Frame system is configured to user specifications and provides the flexibility to be used for troughs, returns or a combination of the two, as well as utilisation for single and dual idler returns. Cove is even supplying a Smart Frame setup at one Western Australian gold site where the conveyor has a walkway on only one side. All return idlers will be accessible from the single walkway. “It is often retrofitted to older conveyor systems,” adds Lay. “The Smart Frame concept is an idea of reversing a process; instead of lifting a belt you are removing an idler from the belt itself,” he says. A specialist in conveyor, gearbox and container crane technology and engineering, The Wollongong, New South Wales-based engineering company works locally in Queensland, NSW and Western Australia and internationally in Chile. It introduced its first version of Smart Frame to market in 2006. This article originally appeared in the December 2018 issue of Australian Mining.